Ryokan Osaka – Osaka, capital of the west, one of the greatest cities to ever grace Japan, and number one rival to its eastern cityscape counterpart Tokyo, is much, much more diverse in culture than you’d originally believe. 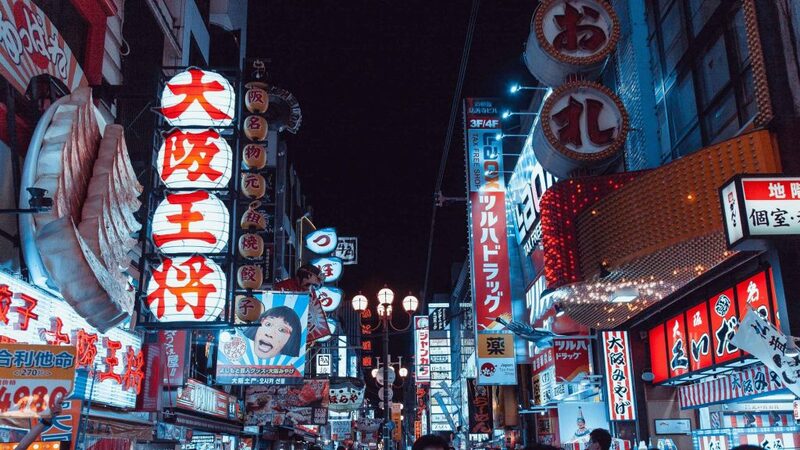 If you’re traveling to Osaka for the first time or you’ve just come straight from Tokyo, chances are, you’re gearing up for a few days of exploring the city that claims to be vastly different to Tokyo in many aspects. However, from the outside, it may seem that the city crowds are the same, and the lines for Michelin-starred restaurants may look highly familiar, and even the castles on your to-do list are starting to merge into one structure in your mind, but to really capture the unique aspects of Osaka, you will need to dig a little deeper. For example, did you know that Osaka’s nickname is ‘Tenka no Daidokoro’ (literal translation: the nation’s kitchen) because it’s arguable the absolute food mecca of Japan? 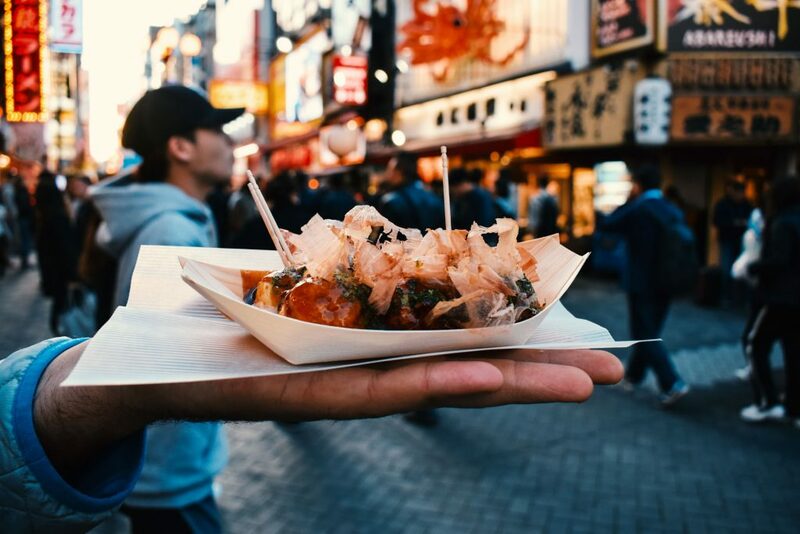 Whilst you can get okonomoyaki, takoyaki, fugu (blowfish delicacy), kushikatsu (skewered deep-fried kebabs of meat, seafood, vegetables, etc), and yakiniku in all corners of Japan, Osaka is where it is at; it’s where the best of the best congregate and provide locals and visitors with mind-blowing takes on some of the most traditional and new-era foods in Japan. Another highlight of Osaka is that, if you’re after an immersive traditional accommodation experience in a ryokan, it’s actually much easier to organise than you think! 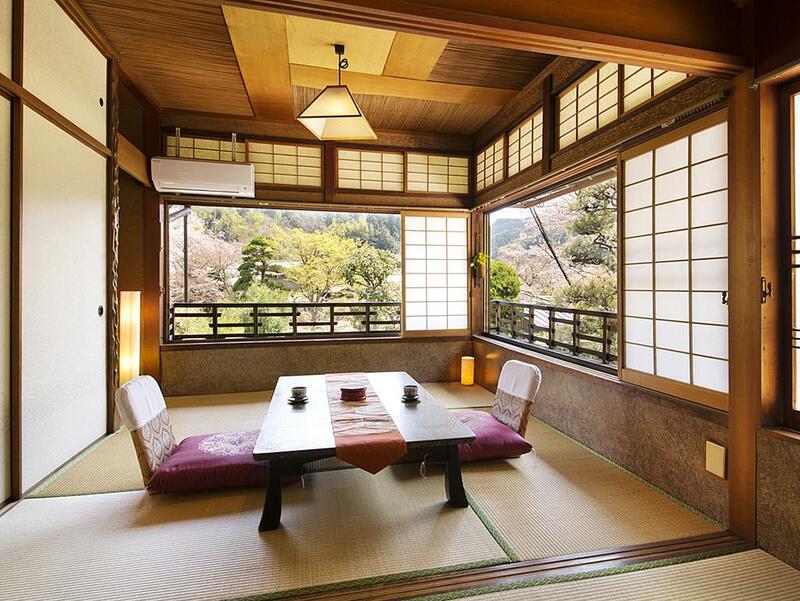 What is a ryokan, you’re asking? They’re basically traditional style Japanese inns that provide simplistic accommodation for those who want to experience Japanese history and culture within the comforts of a stunning structure and famous Japanese hospitality. If you’d like a bit more information on ryokans, have a read of our article here, which breaks down the basics of all that you need to know. Osaka isn’t all about the hotel city life, and the fantastic ryokan selection here just proves it. Some might be in the middle of the concrete jungle, whilst others are just a short train ride away from the city, however, no distance can discredit them from the beauty, ambience, and sentiments you’ll see, feel, and experience when you check-in to one of them. Below we’ve listed our top picks of ryokans in Osaka, based on their services, styling, and customer experience. Let us know if you’ve stayed at any of the below, and what your favourite thing was in the comments section below! 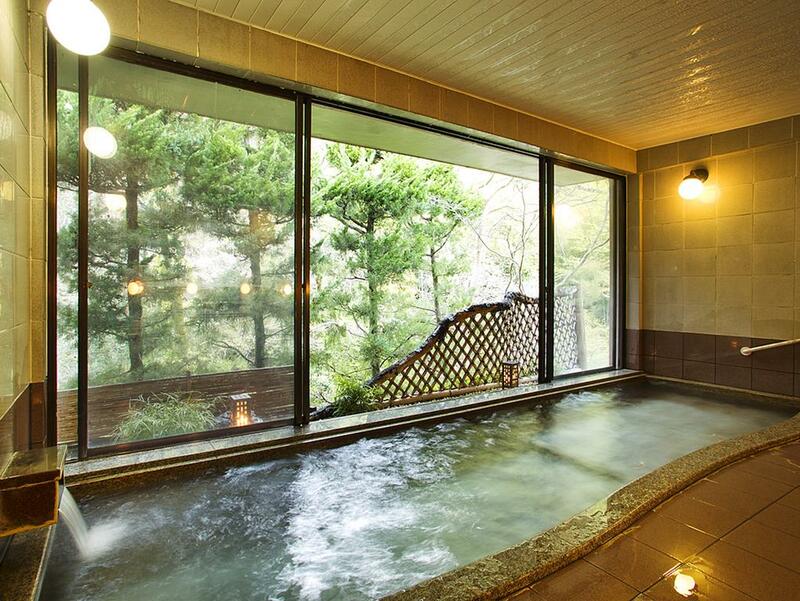 This has been a highly rated onsen in Osaka for a long number of years, and it is no wonder why. For those who want to experience a stunning historic-feeling ryokan, complete with traditional tatami mats, a public bath, sauna access, and true Japanese hospitality, but can’t quite fathom the idea of traveling outside of the city for a few hours to be amongst the quiet serenity of nature, and still want to thrive in the strangely comforting noise of traffic, bustling crowds, and see sweeping views of Dontonburi river from your room, then this is the answer to your wish. Centrally located right along the riverside of Dontonburi, this tranquil escape from the city (which, ironically, is just a step outside of the ryokan) provides you with the level of convenience you didn’t know existed. Whilst tatami-mat flooring and traditional futon bedding is present throughout this entire Japanese inn, modern creature comforts such as free Wi-Fi across all areas, flat-screen TVs, onsite souvenir shops, and western-style breakfasts ensure that you aren’t feeling too far away from civilisation. Close-by points of interest include Nipponbashi Station, Universal Studios, and Osaka Castle. Why Guests Love It: “The room was so comfortable. The breakfast was delicious. 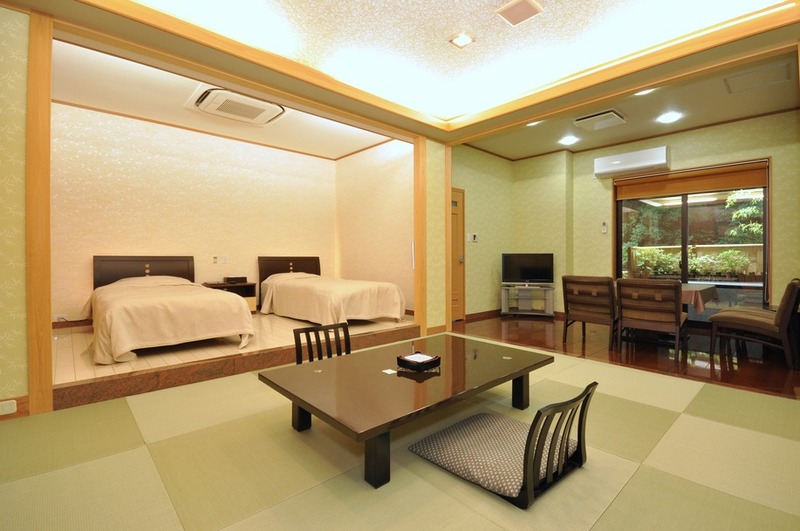 The staff were so friendly and helpful”, “Great ryokan, central location in Dontonburi. Great hotel with a very spacious room for Japan standards! Sleeping on the floor took a while to get used to, but overall had a pleasant stay. Would highly recommend staying here”, “Excellent location just opposite Dontonburi”. 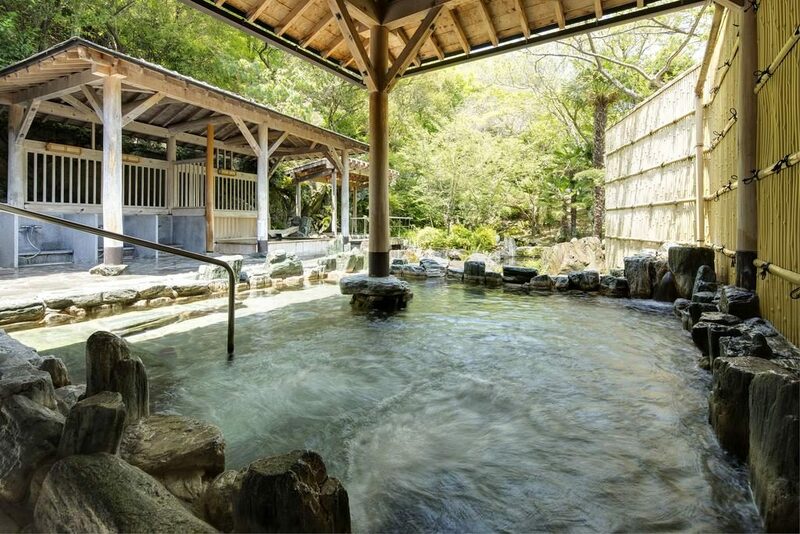 Tucked away deep in the mountain regions of Osaka is Ryokan Okumizuma Onsen, one of the most peaceful accommodation choices you could ever make. This secluded traditional Japanese inn located in Kaizuka, south of the main city area, is the perfect respite from high-rise buildings and flashing neon lights; instead, you’ll be surrounded by stunning nature scenery of trees and mountains, and during certain times of the year, cherry blossoms and many other types of flora. Instead of participating in tours of the city, and spending your days shopping in major complexes, you will be spoilt for choice with options like going for a hike along one of the surrounding mountain ranges, playing mini golf on the nearby course, sinking into the luxurious hot spring bath for the entire day, or even going for a swim in the stunning outdoor pool. 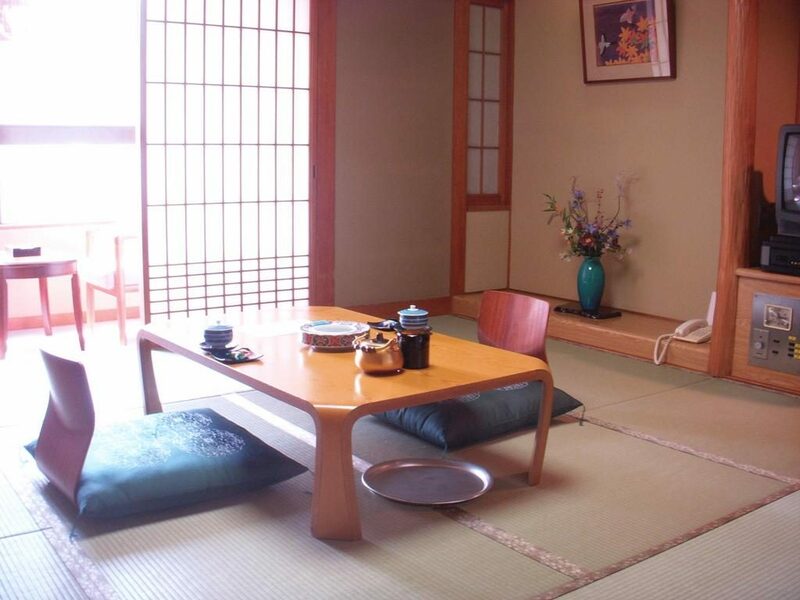 It is considered a ryokan through and through, although it does offer the option of semi western-style rooms as well (with tatami mats but western beds instead of futons). There is Wi-FI within this accommodation, however, it is only offered in public areas. It is about a 5-minute drive from Mizumakan-Non Station. To get to Mizumakan-Non Station, you will need to take the Nankai line from Namba Station to Kaizuka station, and then change for Mizumakan-Non station. The trip will take under one hour, and will cost 840 yen. Why Guests Love It: “We were the only international group but never felt like it. The atmosphere is very friendly, and the service staff were very friendly and helpful. We had a nice one-night stay and would recommend it for sure. 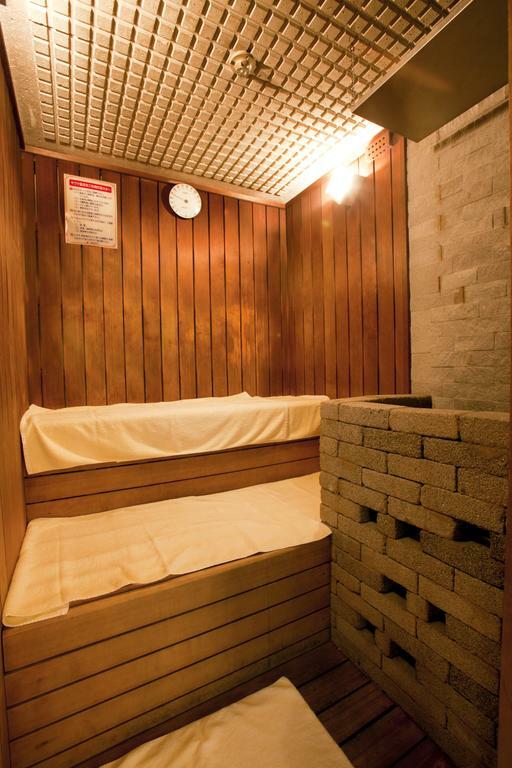 It is worth it”, “Elegant and comfortable environment, staff are very friendly”. Kaneyoshi Ryokan, being located just a 3-minute walk from Nipponbashi subway station, is another entrance on this list that is highly rated as providing an exceptional ryokan experience without being located too far away from civilisation. For those who have no command of the Japanese language whatsoever, this ryokan stands out amongst past guests as being incredibly welcoming to those who speak English, with many staff members able to hold decent conversations. The traditional Japanese rooms complete with tatami flooring, futon bedding and stunning yukata robes are complemented with free Wi-Fi throughout, private bathrooms, even a relaxed internet PC room in the lobby which all guests can use for free. If you’re looking for something that’s closely located to attractions, look no further. From this ryokan, you can simply walk 5-minutes and you’ll arrive at the downtown region of Dotonburi, where Michelin-star restaurants, epic takoyaki food stalls, streets lined with local and international branded shops, and markets await. What’s better than spending an entire day out exploring a city and then walking 5-minutes to get home and change straight into a yukata robe to relax in an onsen? Almost nothing, at this rate! Why Guests Love It: “Email replies were very prompt. The place is within the Dontonburi area and there are many great supper places around. The room, bedding, and bathroom were so pleasant that we couldn’t wait to get back every night!”, “The staff was super friendly! He even searched for us all the train schedule and informed us how to get to anywhere we asked him to.”, “Everything about it was good. I slept well. Nice balcony, roomette overlooking the canal, maps all marked up with the hotel location, Japanese tea, iced water and rice biscuits, great staff, and the traditional Japanese ryokan room was beautiful”. A stunning ryokan reminiscent of the styling prominent in Japanese architecture magazines and historic building throwbacks, Fudouguchikan Ryokan is the epitome of an old-school Japanese Inn but with the modern day attitude welcoming visitors from all corners of the earth. The 11 rooms available are all equally as exquisite as each other, with some offering gorgeous river views, and others including a Japanese-style open-air bath right in the room itself for the privacy amongst the mountains you’ve been dreaming about. The interior of the ryokan will immediately set you at ease, with tranquility simply just permeating through the walls you walk past. The ryokan is located on a quiet street, so rest-assured, your stay will unlikely be troubled by late night partygoers involved in raucous shenanigans. 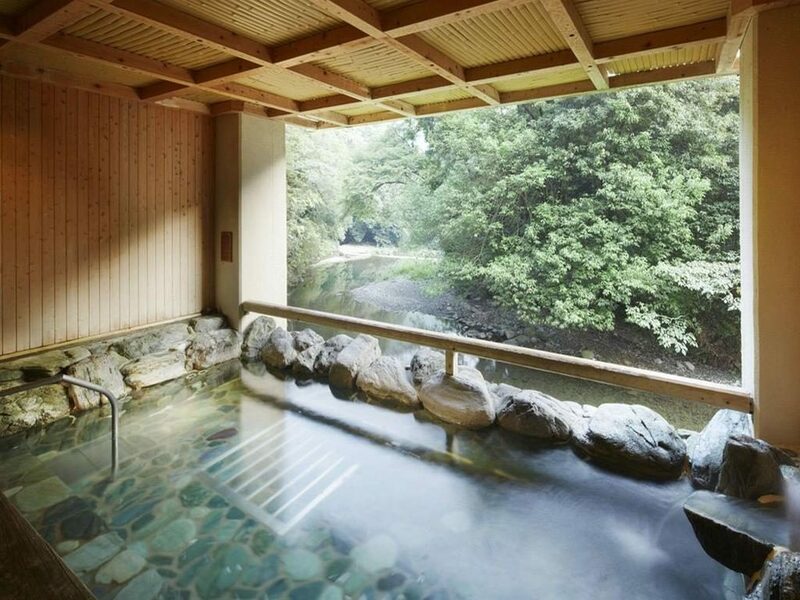 The common hot spring bath area is an absolute dream, overlooking the peaceful trees surrounding the ryokan, and the earthy wooden styling throughout the accommodation will put you in touch with nature from the moment you step foot in it. Services offered by the ryokan include Wi-Fi across all rooms, access to the onsite hot spring, luggage storage, a shuttle service, and free on-site car park. 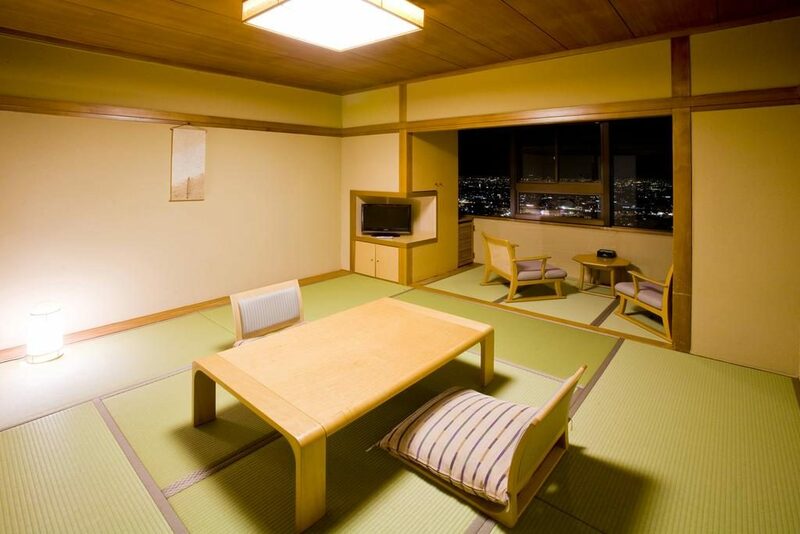 This ryokan is located roughly 30-minutes from Kansai International Airport (catch the JR Kansai International Airport Line “Express” to Hineno Station, and then catch the Nankai bus to Inunaki-yama), and just under an hour away from Namba Station (catch the Nankai main line to Izumisano Station, and then catch the Nankai bus to Inunaki-yama. Its close distance means that everyday, you get the choice of staying amongst the mountains relaxing in the public hot spring, or your own private onsen, going out for a leisurely hike, or if you’re itching for some civilization, just catch public transport out and in just under an hour, you’re amongst the busy crowds again. 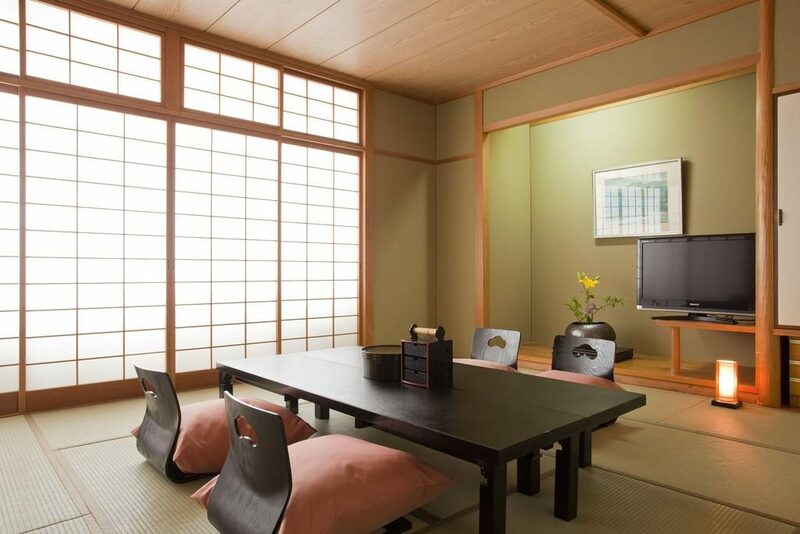 Due to the limited number of rooms at this ryokan, we highly recommend booking it in once you’re certain of your dates, because it can be very difficult to book, especially during the busier periods of cherry blossom season and Christmas, etc. Why Guests Love It: “This was the highlight of our Japan trip. We had a room with private bath on the balcony. It was so relaxing and the room was cozy and super clean. The food was fabulous! Everyone was so kind and helpful even with our lack of Japanese language.”, “We stayed in a room with a private bath and it was excellent. The staff couldn’t have done more for us and even took us on a little trip down the road to watch the fireflies. The room came with dinner in-room and breakfast with the other guests. The food was delicious and plentiful. My girlfriend is coeliac and they were more than willing to adjust her meal accordingly”. Fushioukaku is a ryokan that epitomizes all the traditional aspects of a Japanese Inn into one spectacular accommodation. 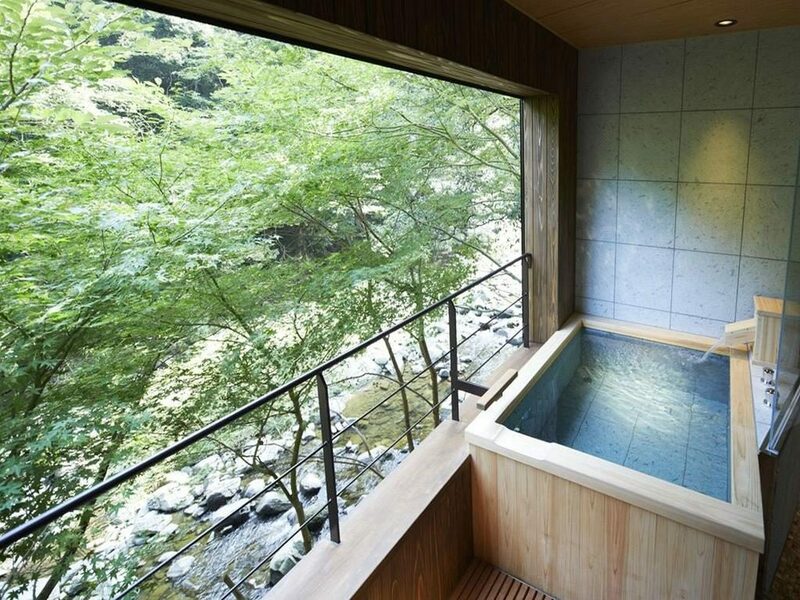 No corners were cut when this ryokan came into fruition, with it’s most outstanding feature, the hot spring bath, bound to take your breath away the moment you lay your eyes on it. 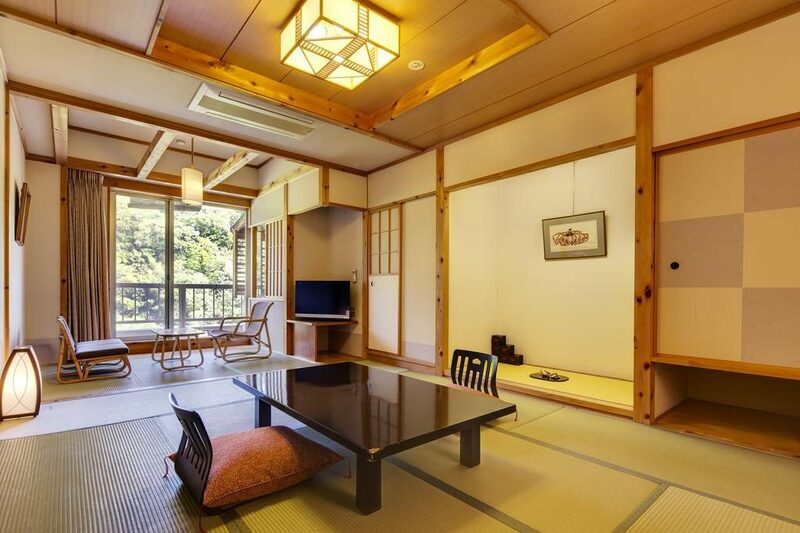 Largely declared by many guests as one of the most beautiful accommodation locations that they’ve ever stayed at, with the hot spring playing a big part in this claim, Fushioukaku comes in big with design, service, features, and price. 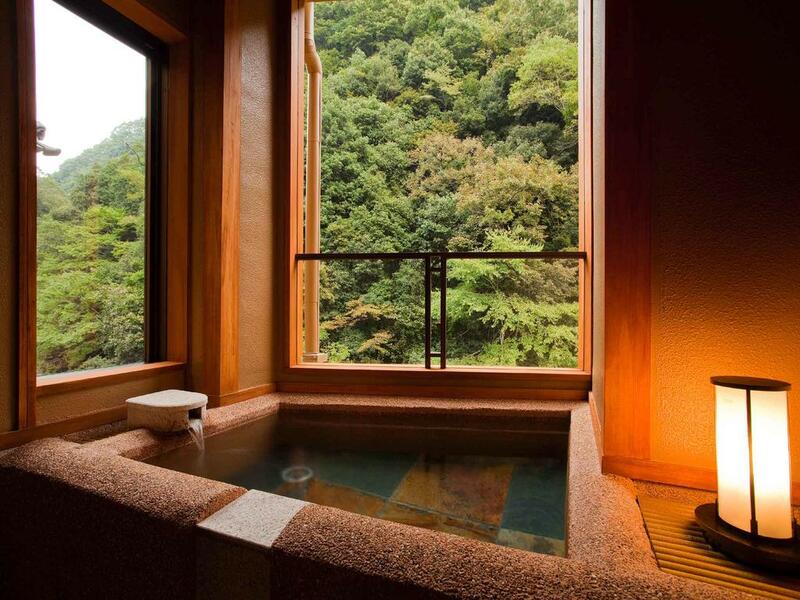 The traditional ryokan rooms open up to sweeping views of the mountains and those with a private open-air baths in their rooms can relax to the sound of absolute peace and quiet during both day and night. There are massage chairs that guests can take advantage of in the lobby, as well as Wi-Fi in all public areas. Guests will be able to use the free shuttle to get to and from the closest station (Ikeda Station), which is a mere 10-minutes away. There is an onsite karaoke room as well as an outdoor pool that opens up during the summer. Why Guests Love It: “Room was large. Indoor bathtubs were as advertised. View of the mountains was breathtaking. Breakfast was delicious and buffet-style. The outdoor (and indoor) public baths were spacious and the best I’ve ever seen. 10/10.”, “Everything about our stay was truly amazing! The food was incredible, the staff put many people at Disney to shame with their friendliness, and the location was exceedingly beautiful! We would definitely stay again!”. The mastermind crafter behind the architecture of the Meiji and Taisho-eras, who also played a huge role in the building of the Marunouchi structure of Tokyo Station, is the very same Tatsuno Kingo who built the Amami Onsen Nantenen. For this reason, the very accommodation building that you will be booking has been registered as an important cultural artifact. Yes, indeed, you’ll be living in the very confounds of what the Japanese consider an important connection to their colourful history. The quiet and nostalgic atmosphere that permeates through the inn will bring peace upon you in ways no other type of accommodation will be able to achieve. The stunning rooms feature equally, if not more, exquisite views of cherry blossoms in spring and koyo in autumn The kaiseki cuisine carefully prepared and proudly served by the chefs are superb in aesthetic and out of this world in flavor (only the freshest seasonal ingredients are used, after all). 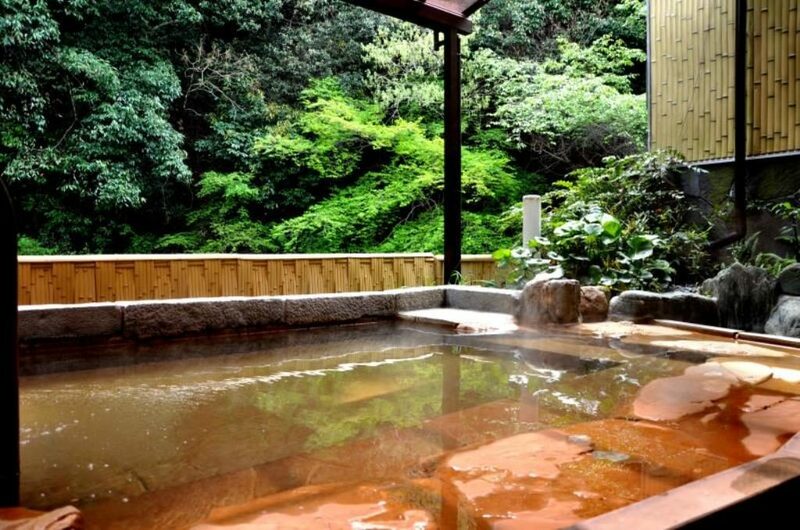 Some rooms offer open-air baths made from crypress wood which is fed water from the natural hot spring nearby, and is kept warm by an iori hearth set beneath the flooring. All in all, for the most authentic ryokan experience you can get, one that puts you into touch with a historic Japan you thought you’d never be able to experience, Amami Onsen Nantenen is the perfect choice. Why Guests Love It: “Excellent traditional Japanese style place to experience authentic way of living wth onsen and food. Really impressed by the good services provided by the staff”, “Onsen experience was great! You may be a little shy at first, but it’s an authentic experience and a highlight of my trip. Wearing the provided yukatas was comfortable. Staff were helpful and friendly”, “It’s just a minute walk away from the train station. They spoke good English and were very polite. The ryokan was beautiful with autumn leaves and mountains all around”. 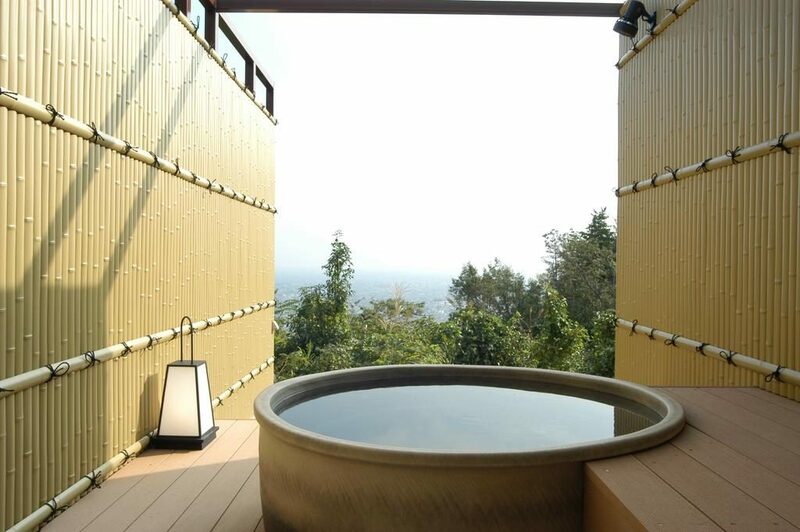 Located within the Meiji no Mori Minoo Quasi-National Park, this hotel offers sweeping views of the plains of Osaka like no other ryokan before it. If you are after a memorable Japanese inn experience that doesn’t skimp out on the views to cater for the more traditional ground-level structures built around ponds and trees, then Minoo Sansou Kaze no Mori is your top choice. During the day, the view of Osaka is breathtaking, and at night, when the surrounding town is lit, you will feel like you’re almost alone in the world up in your room. There is also the option of booking the room with an observatory open-air bath because, let’s be honest, who wouldn’t want to enjoy the twinkling lights of Osaka whilst lapping in the luxuries of a hot mineral water bath? Of course, to truly make the most of your experience, you can only hop into the bath once you’ve cleaned up every morsel on your plate from the renowned delicious kaiseki cuisine that’s dished up by the proud chefs of the ryokan. The flavour explosion from the perfect amount of seasoning on top of the fresh seasonal ingredients will be evident from the first bite. 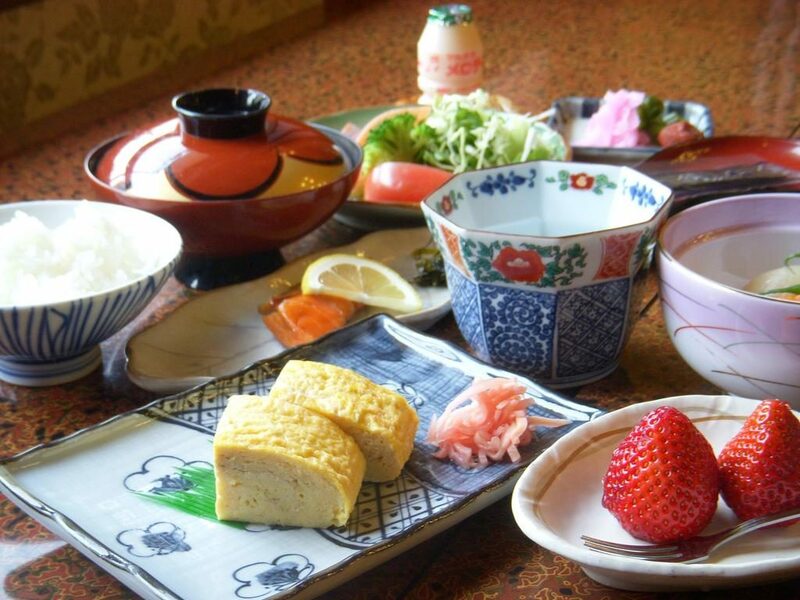 True to traditional ryokan style, all rooms come with a shared bathroom, however, they haven’t left you high and dry – free Wi-Fi and a television is available in all rooms, and a breakfast buffet and dinner is included in the price for the room. Located only 25-minutes from Itami airport by car, or 10-minutes from Mino-o Station (where an hourly shuttle bus is provided by the ryokan), this one’s just outside of the city enough for the peace and quiet you dream about with ryokans, without costing you an arm and a leg and, more importantly, the precious few hours of traveling too far away. From our coverage above and the stunning images of the properties, however will you choose which one to book? Of course, your budget, the time and distance to travel, and the availability of the ryokans all play a big part, and we’d really like to stress that these ones listed are extremely popular! They’re almost on everyone’s list who want the true ryokan experience within the Osaka region, so if you’re keen and you know your dates, absolutely go ahead and book one, you will not regret it.